It seems our state’s esteemed leader has earned himself a big ol’ raise while minimum wage stayed at the same level. In honor, the Squirrel Queen has worked up a little ditty to commemorate the occasion. And up through the House came a money-adding rule. 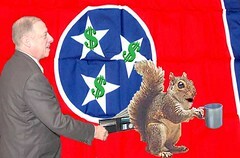 Raise that is, pure profit, Tennessee. So they loaded up their raise and added salary. Bills, that is. Votin’ fools, gubment stars. – The Bredesen Salaries! Well now it’s time to say good-bye to Bred and all voted in. And they would like to thank you folks fer kindly chippin’ in. Cost of Livin’ that is. Add some thou. Take your wallet out. Y’all give more now, y’hear? So, everybody is rooting for Danica Patrick to win the Indy 500 this weekend. If she wins, she’ll chugalug some milk, (an Indy tradition). If she wins, she might kneel and kiss the bricks at the finish line, (a racing tradition). If she wins, she’ll drive her car into the winner’s circle where she’ll be greeted by many well-wishers (a racing tradition). If she wins, she’ll get a kiss from the Indy 500 Princess. (an Indy tradition). 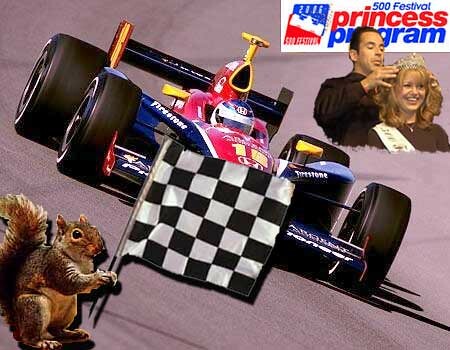 Make that, probably, everybody is rooting for Danica except the Indy 500 Princess, who has to kiss the winner. Kissing the winner of the big race is just one of the obligations for the fair maiden who wins the Princess crown. These women are scholars who must maintain a lofty grade-point average and follow a strict code of conduct, which includes a chaste public appearance with paramours. But does this Princess code include kissing a woman in public. I guess we’ll find out if Danica takes the checkered flag at the end of the 500.
cafeteria ladies. A school in Arizona is limiting the number of ketchup packets students can get for free. After reaching the limit, condiment-craving students must purchase more ketchup. And I thought ketchup was now a vegetable, according to the government. 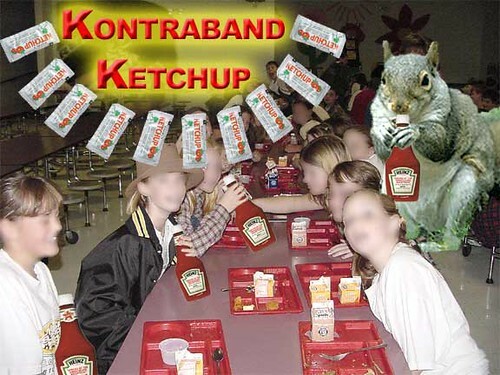 The students have been forced to smuggle contraband catsup into the cafeteria. Some enraged kids have taken up a boycott of the school’s food in reaction. Give the kids more of that red stuff to perk up that extra bland assembly line meal.